Adults should be getting 7 to 9 hours of sleep, but almost half of them are not. Shift workers are getting the least amount of sleep out of all American adults, with over 40% of them getting less than 6 hours of sleep per night. Teenagers should be getting 8 to 10 hours of sleep, but almost three-quarters of them are not. Some school districts are trying to fix this problem of sleep deprivation by pushing back the starting time for school. However, a lot of teenagers just see this as another reason to stay up later. In a large study of Americans and their sleeping habits, almost half a million people were interviewed and asked to report on how many hours of sleep they usually got on an average night. This brought about some interesting statistics, and some that were quite surprising. In total, accounting for all of the states, around 35% of those interviewed said they were getting less than 7 hours of sleep per night on average. That was not the surprising part, but the breakdown between states may be a bit of a surprise for some. Hawaii actually had the worst results in this study, with only 56% of those interviewed reporting to have had at least 7 hours of sleep per night. That really breaks apart the whole image of a tropical paradise that many Americans have when they think about Hawaii. In contrast to that, South Dakota had the best results in this study with 72% of those interviewed reporting to have had at least 7 hours of sleep per night. 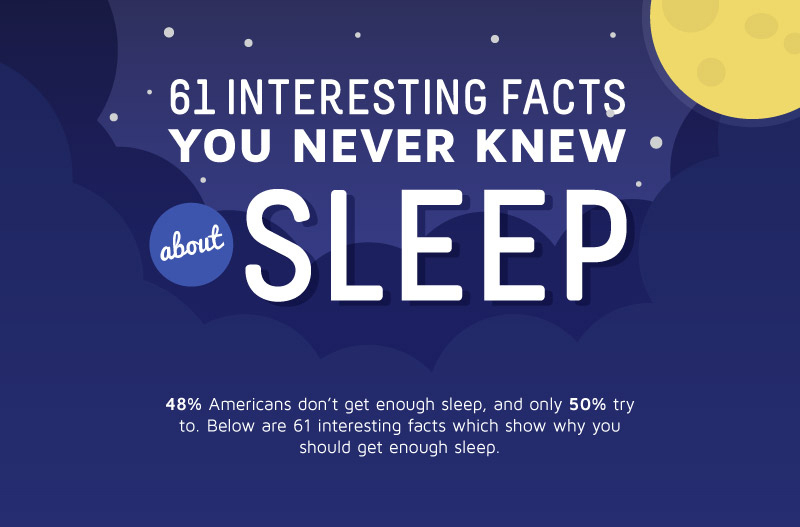 This result lines up fairly well with the rest of the states around the middle of the country – most of these states range from 66% to 71% of people getting at least 7 hours of sleep per night. States that are closer to the east coast are worse off for sleeping habits in general, and the states closer to the west coast only did a little bit better in this study. So, if you are looking for a good night’s sleep, maybe it’s time to head inland for some more quiet time. When you take a look at how much sleep that people are getting around the world, there doesn’t seem to be as much variation as you may have thought. The results are all fairly consistent, with only a few minutes on average separating countries such as the USA, UK, Canada, Mexico, and most European countries. The biggest differences can be seen in the sleeping patterns in Japan, South Korea, and some other Asian countries, which get about one hour less sleep than the USA. In another set of sleeping facts that should come as no surprise to most people, most Americans like to sleep in on the weekends. On Friday and Saturday nights, Americans sleep for almost half an hour longer on average. It’s probably safe to say that most people would love to sleep in every day of the week as well, but work, parenting, and other responsibilities mean that is just not possible. American kids and teenagers tend to go to bed later than adults, and then wake up later as well. It’s not their fault, and they’re not just lazy. Other studies have shown that younger people are just hardwired to stay up later. No matter what you try to do, there are real biological causes that come in to play, making younger people get tired later in the day than adults. Couples tend to go to bed earlier, and wake up earlier as well. This may not have anything to do with actually being in a couple, but more based on the fact that the couples surveyed were in their 20s, 30s, and beyond, and all of these age groups tend to wake up earlier for work compared to other groups. More than half (58%) of workers in this study reported that they feel like they are not getting enough sleep, and 61% of workers say that their work is negatively affected by their lack of sleep. Just under half (43%) say that they have caught a co-worker sleeping on the job, and 20% have used some of their sick days just to get more sleep. When you look at the big picture, all of these tired workers are causing quite a large drop in productivity overall for the businesses that they work for. There is no easy solution to all of this, obviously, because we have all experienced days at work where we know we’re not getting as much done as we should be. It’s easy to say “just get more sleep” but in reality that just isn’t possible for many people, at least not on a consistent basis. Apart from some health issues that can build up over time due to constant lack of sleep, there are some more immediate dangers. For example: around 7.5 million Americans each month actually fall asleep while driving. This is usually only for a few seconds at a time, but that is all it takes to lose control and run off the road or, even worse, hit another car or pedestrian. In 2014, there were 846 fatal crashes involving drowsy drivers. These deadly accidents usually happened from midnight to 6am, and most likely involved drivers who were used to being at home and in bed at the time. There can also be harmful and even deadly accidents at work due to lack of sleep, particularly for those who operate or work around heavy machinery and other dangerous equipment. More than 8 million Americans use prescription sleep aids in order to get a good night’s sleep. More women reported using these sleep aids than men – 5% to 3.1%. This does not signify abuse in all cases, but it can lead to more serious drugs if their initial prescription is not working over time. One in five Americans drink alcohol to get to sleep. Again, this does not signify abuse in all cases, as most of these people are only having a glass of wine or something similar a few hours before bed time. Stress can also lead to insomnia, and that can lead people back to drugs and alcohol in order to cope. This often starts a cycle of dependency, as some people can wake up tired the next day after drinking or taking heavy medication, which leads to poor job performance and even more stress. Around half of those surveyed, 52% of men and 42% of women, said that stress caused them to lose focus on their work. There is still more to learn from this study. If you haven’t gone through the whole graphic yet, you really should. If you’re having problems sleeping, you may find a few easy ways to fix that, but it may also take some fairly major lifestyle changes. Getting more sleep has been shown to increase well-being in most people, up to a certain point, but sleeping too much can have some negative effects and can also be one of the signs of depression. Founder & CEO of MattressInsider.com which specializes in hard to find mattresses for RVs, Boats, Trucks, Sofa Beds, and Aircraft.